In the renovated docklands of South East London, on the bank of the river Thames, the doors of the Dusk are open for business. Bets are called, cards are dealt and roulette wheels spun. As fortunes are won and lost, an inhuman killer stalks the local avenues and alleyways – a killer with a taste for human flesh. Is there more to casino owner Reggie ‘The Gent’ Mead or is he just a common gangster? What secrets are hidden in the bowels of the Dusk? And what connection does the apparently sleazy Bermondsey casino have to a long-buried government initiative known as Project: Twilight? But are the stakes too high? Colin Baker’s reaction at the end of the first episode is perfect, as he realizes that the very people he’s trying to help are creatures that, as a Time Lord, he is sworn to destroy; vampires, a race of beings who once brought the Time Lords to the very brink of destruction before the Time Lords fought back in a struggle that decimated dozens of inhabited planets. First seen in the Fourth Doctor serial State of Decay and throughout numerous comics and books, vampires are a staple of fiction and it’s no surprise that Big Finish took a stab at a story about the undead. What could have been a simple by-the-numbers story instead becomes a crackling, action-packed audio with a touch of drama, amazing sound effects and an incredible supporting cast as a vampire story akin to the likes of Channel 4’s series Ultraviolet. Out of all the places in the universe, there’s only one place to get the best Peking duck, and that’s Southeast London. But while eating prawn crackers and chicken fried rice, the Doctor and Evelyn stumbled across a gruesome scene; a nest of slaughtered animals. Who could have done such a thing? What connection do they have to a sleazy underground casino called Dusk? What is the Forge, and who is its agent who hunts the denizens of Dusk? And why is the Doctor so desperate to find a cure for their condition? Long before Stephanie Meyer made the words “twilight” and “vampires” synonymous came this tale from the pens of Mark Wright and Cavan Scott, who would go on to solid careers as writers for both Big Finish and other companies. These aren’t your normal vampires, however. During the Great War, the British Empire needed super soldiers to fight the Kaiser’s Huns for King and Country. Their experiments led to the creation of vampires. These vampires don’t follow the normal rules, however; while they require blood and are super fast and super strong, only some of them are affected by garlic or crosses, while other shrug off stakes through the heart but melt when immersed in running water. Ever since their escape from the Forge in 1917, these vampires have stayed off the radar, trying their best to study their condition and figure out what was done to them. 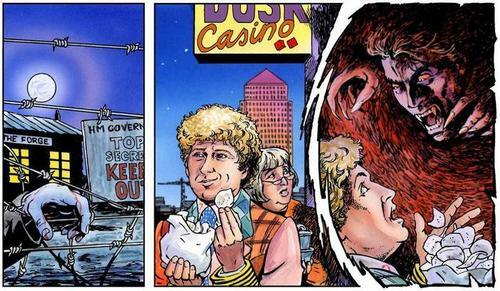 The illegal casino Dusk serves as their front, a source of both money and human subjects for experimentation When the Doctor and Evelyn come across them while investigating a series of animal slayings, the Doctor, upon realizing they have a medical condition, attempts to provide assistance…until an agent of the Forge, Nimrod, reveals that the Doctor’s new associates are vampires. As Nimrod attempts to destroy the creatures, the Doctor attempts to save them, trying to find a way to turn them back into normal humans, lest he be forced to destroy them, as all Time Lords are expected to fight vampires wherever they may be found. A vampire story could have been the perfect excuse for Colin Baker to descend into full-blown Hammer Horror melodramatic overacting. Instead, we get what might be his best performance so far under the eyes of Big Finish. When faced with slavery, medical experimentation, and evil, the Doctor’s rage simmers just under the surface as he instead attempts to help these creatures deal with their condition. The Doctor’s compassion takes charge even as he struggles with the idea that these creatures should be put to death; something that the Sixth Doctor has done to Cybermen and could easily do to them. Baker portrays his confusion and conflict masterfully throughout the first three episodes. When all hell breaks loose in the fourth episode, the rage explodes out of him, and he kicks into full-blown angry hero mode. It’s incredible to listen to his journey during this serial, and it really drives home why the Sixth Doctor is usually considered the best audio Doctor. Project: Twilight gives Evelyn a chance to shine as well, but in a quieter, more dramatic fashion that gives her much more to do than the previous audio Bloodtide. Evelyn and the Doctor bicker like a married couple and do it quite well, but it’s Evelyn’s bonding with a waitress in the club, Cassie, and their relationship during the audio, that once again shows how great a job Maggie Stables does as a companion. She’s still not used to the death and destruction around her, but thanks to the Doctor she’s become an expert at snooping around. When her fate is left unknown during the climax, we can feel the Doctor’s grief and anger because the pair of actors have done such a great job building up that bond between them. There’s even a great throwback line about how often she’s had to fish the Doctor out of the Themes, a reference to The Marian Conspiracy. Maggie Stables has been a treasure to Whovians, and it’s a tribute to her and Baker’s chemistry that Big Finish released a pair of Six/Evelyn audios back to back. The supporting cast is equally as amazing, well up to the task of portraying the undead. Holly de Jong plays Amelia, the head vampire/scientist desperately studying their condition. She quickly switches between innocent victim, helpless at the hands of her curse, and a vicious killer, a byproduct of her condition. Even though she comes off as the villain, the listener always left wondering if they’re wrong about her…but there’s nothing to wonder about her right hand, Reggie Mead as played by Rob Dixon. He’s a Docklands gangster with a vampiric streak to match and plays it to the hilt; his strength is his trump card. He menaces Evelyn, threatens the Doctor, and what he does to Cassie is enough to make the listener cheer when he gets his; his death is portrayed gloriously through the use of sound, and I actually went back and listened to it again as soon as he kicked the bucket. Rosie Cavaliero plays Cassie Schofield. Here just a waitress at Dusk who meets a horrific fate and a terrifying new future, Cavaliero’s performance is one for the books, both as a waitress on the run from the responsibilities and as a creature of the night who is scared of what she is and what she’s capable of. And finally, Stephen Chase plays Nimrod, who I should point it is NOT the character from the Seventh Doctor TV serial Ghost Light. Chase plays an agent of the Forge who is hunting the vampires, and he plays it quiet, understated, and creepy. He’s powerful, but not powerful enough to simply attack the vampires head on. Is he an ally of the Doctor, or is the enemy of my enemy still my enemy? Whatever he is, he knows about the Doctor’s time with UNIT and wears body armor forged from the same materials used by none other than the Daleks. Chase plays the middle perfectly, coming off right in the grey area between hero and anti-hero. The sound in this serial is superb as well. The score is reminiscent of early John Carpenter, and the deaths of the vampires, especially at the end of the second episode, stick with the listener. It’s a throwback to the “grim” days of Baker’s early TV run, and it works perfectly on audio. The script by the pair of Mark Wright and Cavan Scott moves at a brisk pace, never slowing down, and throws in several melodramatic lines for the villain that work perfectly. It’s the start of a career that will cover several Big Finish productions and lead the pair into other fields of science fiction as well. Final Synopsis – Baker and Stables and Company bowl this one right through the wicket. By the time this grim, fast-paced serial is over, good has won (barely), but the story is far from over. 5/5. Peter Davison is the Doctor in…The Eye of the Scorpion. This entry was posted in Big Finish Review and tagged Colin Baker, Doctor Who, Evelyn Smythe, Nimrod, Sixth Doctor, TARDIS, Vampires. Bookmark the permalink. I forget, when was Project Twilight originally released? It was almost certainly before Doctor Who returned to television in 2005. It’s interesting that the Forge, an amoral, ruthless top secret government agency that reverse-engineers discarded alien tech, ostensibly with the goal of “protecting” the planet, very much presages the introduction of Torchwood. 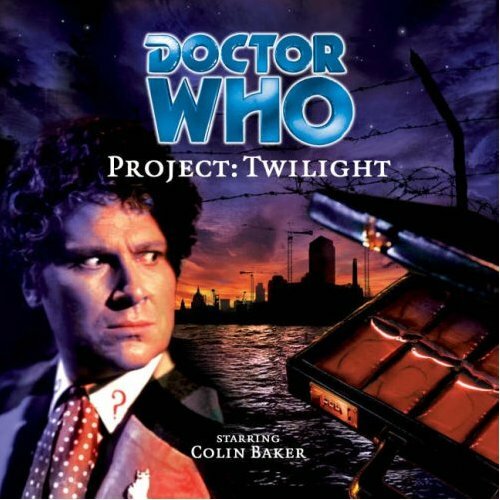 Project: Twilight was released 20 August 2001. And I’ve seen a lot of themes and concepts so far in the audios that have made it into the revival. Nothing that’s a blatent rip-off, but things like the Forge/Torchwood similarities. The upcoming Jubilee and Spare Parts were the basis or inspired a lot of ideas for Dalek, which was written by the same gentleman who wrote Jubilee, Robert Shearman and Age of Steel/Rise of the Cybermen as well, with Marc Platt getting a credit for the concept in the TV episode.